Community College Month is a campaign to raise awareness about the importance of our institutions to communities and to students. According to the AACC, there are more than 12 million students enrolled at community colleges across the country, institutions that serve an incredibly diverse student population and put millions of people’s educational and career goals within reach. In turn, these institutions are supported by faculty, staff, and administrators who are truly a testament to what it means to commit deeply to whole-student success. 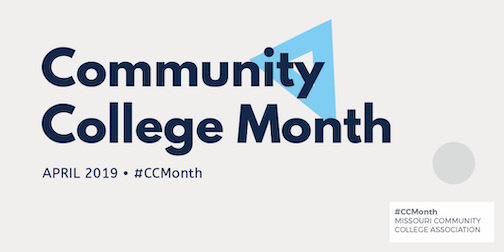 Share your community college story on Twitter, Facebook, and Instagram by tagging posts with #CCMonth. Provide information about the community college system with those who will be attending college soon. With the ever-escalating tuition costs, a community college might be a great option for many. Attend and participate in the variety of programs and events your local college offers. Advance the agenda by working our legislative priorities into your talking points to to make a difference for students. Consider establishing a scholarship at your local community college. An annual gift of $250, $500, or $1,000 really does make a difference! Use #CCMonth to share your inspiring stories.